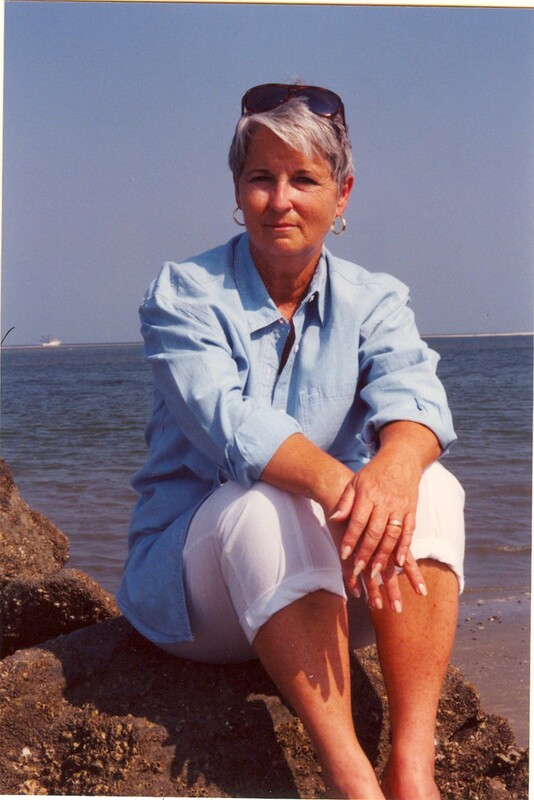 Kathy self-published her first Bay Tanner mystery, In For a Penny, then was picked up by a regional publisher. After the publication of And Not a Penny More, she received “The Call.” An editor, having discovered the books while visiting family in nearby Beaufort, offered her a two-book hardcover deal with St. Martin’s Press, and she has been writing for them ever since. Kathy’s other books in the Bay Tanner series include, Perdition House, Judas Island, Resurrection Road, Bishop’s Reach, Sanctuary Hill, The Mercy Oak, Covenant Hall, and Canaan’s Gate, just released on April 27. I’ve never had children of my own, so it would be presumptuous of me to compare launching a book with giving birth or sending a child off to school. Still, I have a feeling the experiences are not entirely dissimilar, at least emotionally. 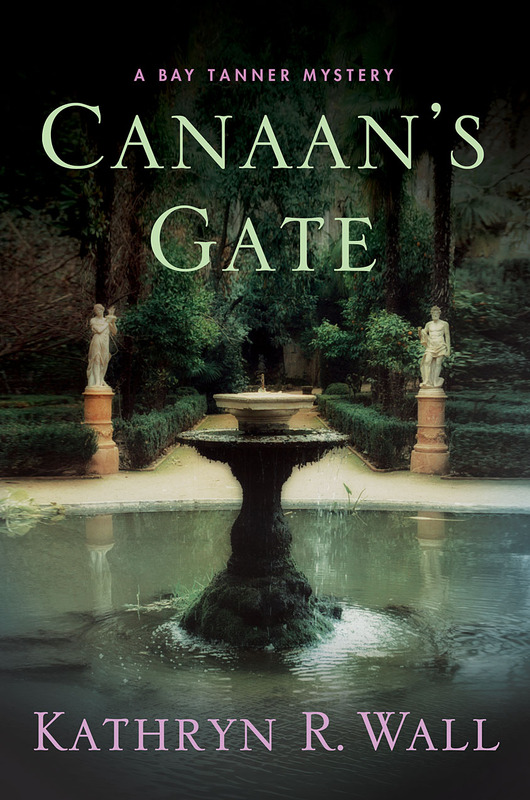 Last Thursday, Canaan’s Gate, the tenth Bay Tanner mystery, had its grand unveiling. Getting my new books off the ground has become an annual event at Jump & Phil’s, a Cheers-like bar and grille here on Hilton Head Island. The owners, two guys who went to the University of Georgia together, were my friends before they were Bay Tanner fans, and it sure doesn’t hurt that I’ve set scenes in their establishment for the past nine books. In fact, “my” table sits in the back in the corner near the fireplace, and the wall behind it is surrounded with framed copies of my book covers. Thursday night we had a great crowd. Since we’re now devoid of independent bookstores this side of Beaufort, a local gift and stationery store that stocks my mysteries handled the sales. I’d sent out postcards, and there were posters at Paper & Party Plantation, at the restaurant, and in the window of the Starbucks around the corner. There was a steady stream of folks, most having come to purchase Canaan’s Gate, but also some tourists who just happened to wander in for the best burger on the island. All in all, it was another highly successful event, and we all went home happy. I love it when something like his turns out to be a win-win-win situation. So where do the blues come in? Where—and when—they usually do: about 3:30 in the morning when I woke up with my mind racing. Apparently some normally dormant part of my brain had been working overtime while I slept, and I woke suddenly with a feeling of sadness I couldn’t at first identify. I eased out of bed and wandered into the den. Curled up in my husband’s recliner in the dark, I tried to figure out what was bugging my subconscious enough to wake me out of a sound sleep. And here’s what I figured out: it was over. All the planning, the long hours, days and weeks in front of the computer; the worry about getting the plot right and moving the characters along on their life journeys; the rewriting and revising, sifting through the feedback from critique partners and editors; wrestling with the copyedit and the first pass pages—all of that was over. For good or ill, my baby had been thrust out into the world, and there wasn’t a blessed thing I could do about it now. It would be read and dissected and commented upon by people who had spent their hard-earned cash for the right to laud or dismiss my efforts. As I sat there in the dim light from the streetlamp down the way, it also occurred to me that part of what was making me sad was the realization that what I had sweat blood over for more than a year would probably be old news in a matter of days. People would read /Canaan’s Gate/ and that would be that. They’d like it—or not—and move on to other books, other interests, other ways to occupy their hours. I always hope they’ll close the back cover and be sad that it’s over, that they’ll wish that I, like some of my contemporaries, could turn them out more frequently. When people at signings and events chide me (mostly with good humor) for only producing one book a year, I always tell them it’s like Thanksgiving dinner: it takes a whole lot longer to prepare than it does to eat. Maybe not the best analogy, but it usually brings a smile, especially from women of a certain age who actually cook. Still, I wonder sometimes if the average reader has any clue how much of a writer’s life and blood is poured into the creation of even the most fleeting work of literature; how long a journey it is from those first tentative keystrokes, eyes locked on an intimidating blank screen, to sitting at that table smiling proudly, surrounded by stacks of books. They probably don’t, and I guess there’s no good reason that they should, any more than I have a true concept of how an artist transforms a pristine canvas into a thing of breathtaking beauty. The creative process is a strange beast, and maybe it’s better not to try to dissect it too finely. Sometime during all this rumination, I got sleepy again and eventually crawled back in beside my husband. The next morning, I woke feeling upbeat, the blues in the night a faint memory. I’m so lucky to be where I am, doing work I love, and, hopefully, bringing pleasure to readers. Can’t ask for much more than that, can you? And besides, I have next year’s book to finish. I've used that Thanksgiving dinner analogy myself -- a book a year is a LOT of work! And readers gobble them up so quickly! Congratulations on the new launch -- I'm sure you're laying down the keel for the nest Bay Tanner already. Thanks, everyone, for the good wishes. I'm such a novice at this blogging thing, but it's nice to get immediate feedback. I guess that's what's lacking in novel writing--it takes so blessed long to find out if you've succeeded or not. BTW,I had an e-mail this morning from someone who had picked up CG at the library and finished it that night! Thanksgiving dinner, indeed. Kaye, I'm thinking of you and Donald and wishing you all the best.